If the number of wineries you can visit comfortably in one day constitutes a critical mass, the Shuswap region around Salmon Arm qualifies with six wineries. It has taken a while. Larch Hills Winery, which opened in 1997, was the first in the area. Sunnybrae Estate Winery, profiled in a previous blog, is the most recent, opened this spring. This is British Columbia’s northernmost cluster of wineries and vineyards, an hour’s drive from the north end of the Okanagan and half a day’s drive from the great concentration of British Columbia’s wineries. It is easy for wine tourists to overlook this group. You shouldn’t. If you are driving by on the Trans-Canada or taking in the Adams River Salmon Run or vacationing on a Shuswap houseboat, save a little extra time for touring these northern wineries. Here is a modest guide to the wineries and some of their best wines. Larch Hills Winery, about a 15 minute drive south of Salmon Arm, is British Columbia’s highest elevation vineyard at 2,480 feet. From the top of the steep south-facing vineyard, you can see the beginning of the Okanagan Valley in the distance. The owners are Jack Manser, formerly a forester in Switzerland, and his wife, Hazel, who bought the winery in 2005 from founders Hans and Hazel Nevrkla. The non-irrigated vineyard grows the cool-climate varieties appropriate for the location, including Ortega, Madeleine Angevine, Siegerrebe and Maréchal Foch. The Larch Hills wines are consistent and reliable. Mad Angie 2008 ($15.40). This is the winery’s cheeky name for its Madeleine Angevine, a white with a floral aroma, flavours of melons and green apples and a dry finish. 88. Siegerrebe 2008 ($16.40). This early-ripening white invariably is a crowd pleaser because of the dramatic aroma of spice and fruit and the tropical fruit basket of flavour. The Larch Hills example is particularly intense and exotic. 88. Gewürztraminer 2009 ($16.40). This is an appealing wine with a spicy aroma, lychee flavours and a satisfying weight and texture, with a dry finish. 89. Tamarack Rosé 2008 ($15.40). A juicy wine with a crisp finish, this has flavours of raspberry and cranberry. It is made with Lemberger and St. Laurent grapes. 89. Grandview Bench Red 2009 ($16.40). A full-bodied blend of Maréchal Foch, Merlot and Lemberger, this has flavours of plums and red berries. 88. Maréchal Foch Special Reserve 2008 ($19.40). A good concentrated red with soft tannins and flavours of black cherries and plums. 89. Lemberger Dessert Wine 2010 ($20.90 for a half bottle). This is a cheerful dessert wine that tastes like cherry and mint candies, with a good balance of acidity and sugar. 90. Recline Ridge Vineyards & Winery, located at Tappen, just west of Salmon Arm, was established in 1999 by Mike Smith and was taken over last year by Graydon and Maureen Ratzlaff. They moved from Metro Vancouver where Graydon has had a long career in the food processing industry. He was drawn to wine during a four-year-stint when he set up and ran the wine products plant for Vincor’s Spagnols division in New Westminster. The winery relies on grapes from its 7 ½- acre vineyard and also buys a large vineyard nearby. Graydon would prefer to showcase the wines of this northern region rather than padding this list with wines made from Okanagan grapes. My recent visit was a little too early: the winery had not yet bottled and released its 2010s. The wines to come this summer will include Recline Ridge’s first Bacchus; a rosé called Make Me Blush; and Optima desert wine called Hummingbird’s Kiss; and a Zweigelt/Blaufrankisch blend called Hawk’s Haven. The latter two wines are tributes to Graydon’s parents, Jack and Agnes, who both died in the past year. Of those wines on the current list, try the Siegerrebe 2009 ($17.90), another spicy and tropical crowd pleaser. 88. Granite Creek Vineyards, just a kilometre further along the road from Recline Ridge, was opened in 2004 by Gary and Heather Kennedy with their son, Doug, and his wife, Mayka. Their 10-acre vineyard, planted in 2003, grows similar varieties as the other vineyards in the region. They also make wine from Okanagan grapes, reflected by the current offerings in the tasting room. Viognier 2008 ($20) has the creamy, rich texture of the varietal, with flavours of apricot and pineapple. 88. Riesling 2009 ($17) shows tropical flavours of lime and grapefruit, with a refreshing finish. 88. Syrah 2006 ($23) shows aromas and flavours of black cherry, plum and pepper. 87. Meritage 2007 – the winery prefers to give its reds plenty of bottle aging before release – has a firm structure with flavours of currants, a hint of coffee and chocolate and a long finish. 88. The newest products in the tasting room include excellent wine jellies made by Heather. Ovino Winery was opened last year by John Koopmans on what was a former dairy farm about twenty minutes south of Salmon Arm. There is a small flock of sheep on the property now. That inspired the winery name, ovino being a word for sheep in several romance languages. John keeps it simple, pricing every wine at $15 and producing between 800 and 1,000 cases a year. His initial preference would have been to make just dry white wines but, recognizing consumer demand, he also has reds and a few off-dry whites. Pinot Gris 2010 is crisp and clean, with aromas and flavours of citrus. 88. Pinot Tramino 2010 is one of the winery’s best sellers. It is an off-dry blend of Gewürztraminer and Pinot Gris, with rose petal spice on the nose and with flavours of citrus and peach. 87. Gewürztraminer 2009 has good weight, with aromas and flavours of spice and orange peel. 88. Gewürztraminer 2010 reflects the vintage, being lighter and crisper, with delicate rose petal aromas. 87. Pinot Meunier 2010 is a light, easy-drinking summer red, with aromas and flavours of cherry. 87. Maréchal Foch 2010 is medium bodied, with the variety’s smoky undertone to the cherry flavours. 87. Entice 2010 is a blend of four white varietals and made in a dessert wine style. It has fresh apple and melon flavours. The 55 grams of residual sugar are very nicely balanced with vibrant acidity. 88. Celista Estate Winery opened last summer near the community of Celista on the north arm of Shuswap Lake. British Columbia’s most northern winery, it is 30 kilometer drive from the highway through a landscape that ranges from forest to beachside. The owners are Jake Ootes and his wife, Margaret Baille-Ootes. He is a former publisher, political aide and Yukon minister of education while she formerly owned a Yellowknife art gallery. Their vineyard and winery occupy part of a rambling property that also includes rental accommodation for summer tourists. They are almost certainly the only British Columbia winery owners who have put sketches of themselves on the wine labels, but done very tastefully as one would expect from a former art gallery owner. “This is our product and we stand behind it,” Jake explains. Riesling 2010 ($18) is a pleasant dry white with flavours of citrus and spice. 87. Conundrum 2010 ($22) is a fruit blend of four varieties including Gewürztraminer, Siegerrebe and Ortega. It begins with a spicy aroma, has citrus and spice flavours and a dry finish. 88. Celista Cuvée 2010 ($16) is another refreshing white blend with flavours of green apples and citrus. 88. Marg’s Rosé 2010 ($20) has bright, vibrant hue, reflecting the deep colour of the Maréchal Foch grapes used for the wine. It has aromas and flavours of strawberries and has a crisp dry finish. 88. Maréchal Foch 2009 ($19) is good quaffing fruity red, with flavours of cherry. 87. Still to be released is an oak-aged Foch. Eleven wineries emerged as winners in this year’s competition for the Lieutenant Governor’s Awards for Excellence in British Columbia Wines. Eighty-three wineries submitted 309 wines (compared with 71 wineries and 281 wines last year) for this tough British Columbia wine competition. A maximum of 12 awards are available. The awards will be presented to winemakers at the end of July by Lieutenant Government Stephen Point, with award ceremonies at each winery. This award is well established since its 2003 inauguration in 2003. This year, the Lieutenant Governor of Ontario launched a similar competition for Ontario’s wineries. The winning wineries in British Columbia include previous winners as well as first-time winners. Howling Bluff Estate Winery 2009 Summa Quies Pinot Noir ($32 but sold out). This winery won an award two years ago with an earlier vintage of Pinot Noir. This wine begins with glorious aromas of strawberries. Big and fleshy on the palate, yet with the classis silky texture emerging, this seductive wine has flavours of cherry and strawberry that linger and linger. Laughing Stock Vineyards 2010 Pinot Gris ($20). This is a well-balanced wine with good weight, with flavours of pear and apple and with a subtle hint of oak. A first-time winner. Mt. Lehman Winery 2009 Viognier Reserve ($N.A.). This wine has aromas and flavours of apricots and peaches, with the rich texture of this varietal. Mt. Lehman opened in 2009 just north of Abbotsford. Vern Siemens, the owner and winemaker, grows primarily Pinot Noir in the vineyard there. But he also buys Okanagan grapes to make varieties, like Viognier, that would not ripen adequately in the Fraser Valley. A first-time winner. Quinta Ferreira Estate Winery 2008 Syrah ($24.90). The winery produced 625 cases of this wine. This is an appealing red with gobs of sweet fruit on the palate; aromas of black cherry and deli meats. A first-time winner. Red Rooster 2008 Reserve Meritage ($22.99). This is 58% Cabernet Franc, 38% Merlot and 4% Malbec. It is interesting to see a fine Meritage built around Cabernet Franc, a fine brambly-tasting variety that lights up many blends. This wine showed aromas of spice, vanilla and red berries, with flavours plum, black cherry and cassis. The winery won an award of excellence for a Gewürztraminer in the first competition. Sandhill 2009 Small Lots Syrah ($N.A.) This is a big, concentrated wine with aromas of pepper and deli spices and with flavours of black cherry, plum, chocolate, even earth. Sandhill has won several previous awards, including for an earlier vintage of this wine. St. Hubertus & Oak Bay Estate Winery 2009 Dry Riesling ($N.A.). This is a classic Riesling, with its hint of petrol, its spine of minerals and its tangy flavours of lime and grapefruit. A first-time winner. Stoneboat Vineyards 2009 Pinot Noir ($25). This winery won previously with an earlier vintage of Pinot Noir as well as with a Pinotage. The 2009 Pinot Noir has delicate aromas of strawberries, flavours of spice and cherries and thje classic silky texture of the variety. Sumac Ridge Steller’s Jay Brut 2006 ($26.99). This is a blend of Chardonnay, Pinot Noir and Pinot Blanc. In the classic style of Champagne, the wine was left in bottle on the yeast lees for three years before final bottling. The wine presents an onion skin hue, bready notes on the nose from the yeast, and a creamy texture from its fine display of bubbles and its complex fruit flavours. Several vintages of this wine have won awards of excellence, along with other Sumac Ridge wines. Volcanic Hills Estate Winery 2010 Rosé ($N.A.). This winery opened just last year near West Kelowna. This rosé begins with strawberry aromas. The flavours of strawberry and raspberry explode on the palate. The wine has a crisp, refreshing and dry finish. A first-time winner. Wild Goose Vineyards 2010 Mystic River Pinot Blanc ($18.99). Wild Goose is a multiple award winner in this competition but never before with, to quote the winery, “the variety that gets little respect.” In fact, this wine was so good that it was a near unanimous choice of the judges through two rounds of judging. It delivers delicious and focussed fruit flavours, like biting into an fresh Gala apple. The large framed photograph in the tasting room of newly-opened Sunnybrae Vineyards and Winery – a picture of a muscular farmer with his team of Belgian draft horses – immediately conveys a sense of heritage. It is a picture of the late Mac Turner, the father of Barry Turner who, with his wife, Nancy, and their family, has launched the newest of the six wineries in the Shuswap. A stylized image of Mac Turner and his team appears on the labels of all Sunnybrae wines. Barry’s family has farmed in the Sunnybrae district for five generations. The winery’s seven and a half acre vineyard is part of a 20-acre property that once belonged to a Turner ancestor, a Major Mobley, said to have been one of the first non-native settlers. Barry says that his ancestor sold the land in 1907. In 2000 Barry reacquired the land for his family. The idea appealed to him. Barry’s career as a heavy equipment operator and a road builder often has taken him away from home and family. “My plan was, later in life, to phase out of that and get into this full time,” he told me five years ago when he began planting the vineyard. “We have put our whole heart into this,” his wife, Nancy, says now. To negotiate what he called the “steep learning curve” of grape growing, Barry sought advice both from James Wright, who operates the nearby Ashby Point Vineyard, and from Lanny Martiniuk, a veteran vine propagator in Oliver. Barry, who began planting in 2006, now has 2.3 acres of Maréchal Foch, 1.3 acres of Siegerrebe and 1.2 acres each of Ortega, Kerner and Schönburger. And he could plant perhaps another five acres on his perfect slope. It is only recently that the Turners learned of substantial viticultural expertise in Nancy’s family. She is a cousin of Lloyd Schmidt. Lloyd’s father, Frank, (her uncle) once owned an historic Kelowna vineyard. 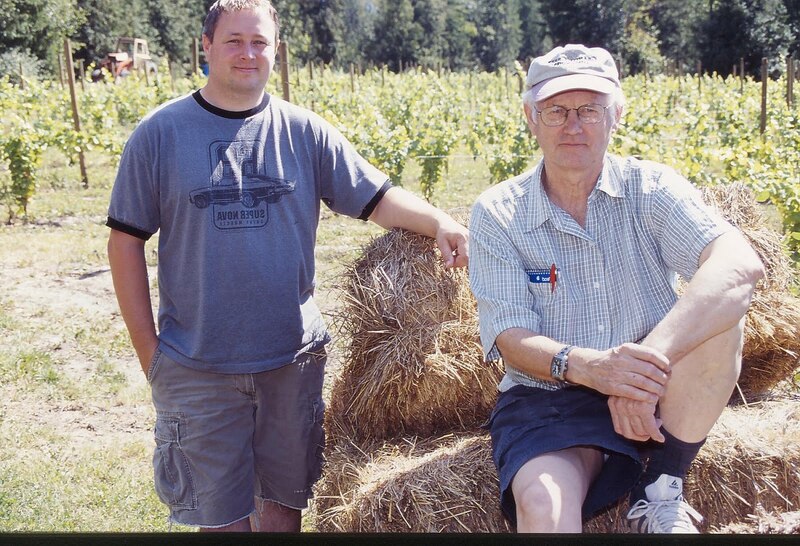 Lloyd, who grew up around vines, was one of the founders of Sumac Ridge Estate Winery. Now, based in Ontario, he is a leading importer of vines for Canadian vineyards. The wines impressed the cousin because Barry, who is not a winemaker, has just continued to do things by the book. 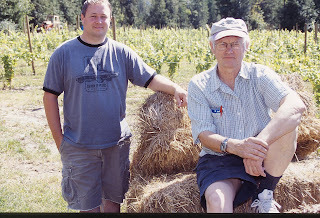 The winery’s first vintage, 2010, was started with consultant Hans Nevrkla, the former owner of Larch Hills Winery (the Shuswap’s original winery) and completed by Jesse Steinley, who is also the winemaker at the nearby Recline Ridge Winery. On Lloyd Schmidt’s recommendation, Mark Wendenburg, the former long-time Sumac Ridge winemaker, consulted on finishing the vintage. Sunnybrae made 1,200 cases in its first vintage, opening its tasting room in May, 2011. Nancy and daughter Kristie Smolne have the tasting room open seven days a week (with extended weekend hours) during the summer; and by appointment. If they happen to be working nearby in the vineyard, they hang a walkie talkie on the door with which visitors can summon them. The winery, with a driveway described as “friendly” to recreation vehicles, counts on strong summertime traffic from tourists camping in the nearby provincial park or visiting Salmon Arm across the lake and only a fifteen minute drive from the winery. Ortega 2010 ($16.90). The wine has aromas and flavours of citrus and apple, with a crisp, refreshing finish. 88. Siegerrebe 2010 ($17.90). The winery’s own notes describe this as a “passionate dance to a composition of citrus, lychee and apricot notes.” The prose may be a bit purple but this is an appealing wine, with aromas of spice and grapefruit. It is a tropical bowl of fruit, finishing crisply. 90. Rosé 2010 ($17.90). This wine is based on Maréchal Foch blended with white wine; the exact blend is kept secret, presumably to thwart competitors from copying. The wine is appropriately light, juicy and refreshing, with notes of strawberry on the nose and palate. 87. Bastion Mountain Red 2010 ($16.90). This wine is named for the mountain that rises at the back of the vineyard, dominating the Salmon Arm skyline. This is a fruit-forward wine made primarily with Foch (the only red in the vineyard). An easy drinking wine, it has flavours of black cherry and chocolate with a smoky finish. 87. Maréchal Foch 2010 ($18.90). This wine is crafted into a wine distinct from the Bastion Mountain Red by being aged in French and American oak. The oak tannins add structure to the Foch, which has soft tannins. This dark-hued wine has aromas and flavours of black cherry, chocolate and coffee. 88-90. In her recent biweekly wine commentary for CBC radio, Barbara Philip MW recommended the JoieFarm 2010 A Noble Blend as a great wine for summer. I would recommend all of JoieFarm’s 2010 wines, which were released this spring, for summer drinking, if we ever get summer. While the wines likely are sold out at the winery, most are still available in private wine stores and on numerous restaurant wine lists. 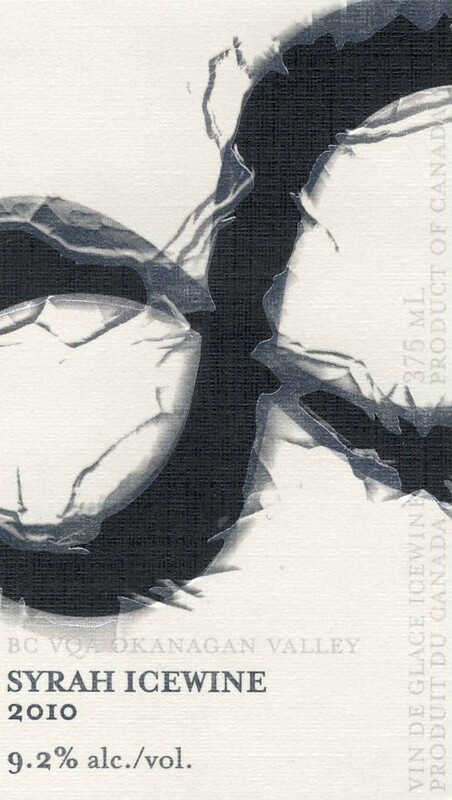 The 2010 vintage, JoieFarm’s seventh, was the coolest in the Okanagan since 1996. In spite of that – or perhaps because of the conditions – the white wines from that vintage are remarkable. Almost every one that I have tasted, including those from JoieFarm, show crisp, vibrant fruit and aromas, usually with racy acidity that give the wines a refreshing tang. How have so many producers made good wines in such a tough year? JoieFarm explains what it did. Its commentary applies generally. Here are notes on the 2010 JoieFarm releases. JoieFarm Chardonnay 2010 Un-Oaked ($22.90 for a production of 1,008 cases). This wine includes 22% Chardonnay Musqué, a clone that has a spicy aroma. This wine has aromas of lemon and lime, flavours of green apples and a crisp, refreshing finish. It immediately reminded me of Chablis. The winery’s notes say that the inspiration for this wine are the Burgundies of Macon as well as Chablis. 89. JoieFarm Muscat 2010 “The Pure Grape” ($22.90 for a production of 453 cases). This wine is made from the first harvest of the winery’s two acres of Moscato Giallo or Yellow Muscat. Michael and Heidi gave it the nickname of the pure grape because the wine tastes almost exactly like the grapes. The wine begins with floral and spicy aromas. The flavours are remarkably intense, showing notes of citrus and white peach. There is a long, spicy finish. The residual sugar is well balanced with bright acidity. 88. JoieFarm Riesling 2010 ($22.90 for a production of 1,119 cases). The nickname is “a delicate balance” – a reference to the balance between the bracing acidity, the residual sweetness (25 grams) and the moderate 11.9% alcohol. The wine dances lightly on the palate, with favours of lime and lemon, and has a very refreshing finish. As appealing as it is now, you should also lay a few bottles down for a year or two. Riesling has a legendary ability to become deliciously complex with age. This wine will age well. 91. JoieFarm A Noble Blend 2010 ($23.90 for a production of 2,671 cases and 552 magnums). The model is the traditional Alsace blend, Edelzwicker, which means noble blend. This is 43% Gewurztraminer, 38% Riesling, 14% Pinot Auxerrois and 5% Pinot Gris, with grapes from eight vineyards as well as from JoieFarm. Putting this wine together – including sorting the fruit at a sorting table – must have been the enological equivalent of doing the New York Times crossword puzzle. The wine begins with aromas of rose petals, herbs and grapefruit. On the palate, there is layer upon layer of flavour – grapefruit, melon, apricot. There is a kiss of sweetness on the mid-palate balanced with tangy acidity in the refreshing finish. 90. JoieFarm Rosé 2010 ($20.90 for a production of 2,198 cases and 552 magnums). This is an astonishing volume of rosé but wines like this have come strongly back in favour in the last five years, with JoieFarm setting the standard. This is 53% Pinot Noir, 25% Pinot Meunier, 12% Gamay and 10% Pinot Gris. The wine has a lovely hue that the winery describes as “bright watermelon” and quite dramatic aromas of strawberries and cherries. It has flavours of strawberry, cranberry and pomegranate. The dry (but not austere) finish and the good weight on the palate make this a satisfying and refreshing wine with many foods. 91. Several years ago, I asked Ian Mavety, the co-founder of Blue Mountain Vineyard and Cellars, what he thought of screw cap closures. Blue Mountain uses corks to close its wines. It is what one would anticipate from a winery whose wines are more informed by the Old World than by the New World. Ian’s reply on screw caps was not surprising. He was referring to what winemakers know, or learned the hard way. The sulphur level is especially critical when a wine is put under a screw cap. If the sulphur is too high, the wine gets stinky under the airtight seal. Of course, when a wine with the correct level of sulphur and with no other defects is bottled under screw cap, the aromas and the flavours are likely to remain fresher than under cork. The wine will develop differently under screw cap than cork. Some will argue that cork development makes a wine more complex. The big switch to screw caps for all wines, not just cheap wines, began a decade or so ago in Australia and New Zealand. It was adopted by producers elsewhere as a way to avoid “corked” wines. That refers to the musty aroma and bitter flavour that wines develop when bottled with defective corks. Corked wines had become epidemic a decade ago. The problem corks are not obvious to the naked eye, manifesting themselves only after the wine has been in bottle for a time. During the past five years, the cork producers responded to the problem by refining quality control so much that corked wines have become rare again. But they still happen. The irony that the only corked wine I have encountered this spring was a bottle of Blue Mountain Chardonnay Reserve 2008, one of a quartet of review wines. It is now sold out at the winery, making a review irrelevant. I don’t expect Blue Mountain to adopt screw caps any time soon, if ever. The winery has been making fine wines and bottling under cork now for 20 years and the number of corked wines from this producer, in my experience, has been insignificant. Blue Mountain never bought cheap corks. Today, Blue Mountain’s clientele would likely be outraged if the winery started using screw caps. The other three recent Blue Mountain releases were none the worse for being under cork. I am sure Ian would argue they were the better for it. Blue Mountain Pinot Gris Reserve 2008 ($25.90). This is a complex wine, at once reminding me of a serious Alsace Pinot Gris and a good Rhone white. It begins with aromas of citrus and yeast (evidence of time spent on the lees to flesh out the texture). There are intense flavours of tangerine and blood orange, with a hint of anise and minerals. The finish is crisp and dry. 91. Blue Mountain Pinot Noir 2009 ($25). This is as bold and forward a Pinot Noir as I have seen in Blue Mountain’s regular range. The cherry aromas are lifted by toasted notes of oak. The wine is full on the palate, with dark cherry flavours and with the classic silky texture. 90. Blue Mountain Pinot Noir Reserve 2008 ($35.90). This wine begins with an alluring aroma of strawberries and cherries. Dark in colour, it has flavours of raspberries and strawberries. The elegant texture includes some firm tannins, allowing this wine to age into a great Burgundy. 93-95. Can commercial wine grapes be grown successfully in Lillooet? This may be the vintage with the answer. Fort Berens Estate Winery has a 20-acre vineyard there which is expected to produce its first harvest this year. One of the winery’s consultants reports that the vineyard is looking good and should produce 40 to 50 tons of grapes this fall. Lillooet is believed to be a warm to hot growing region. Now that the weather is turning after an unusually cool spring, those will be vital growing conditions. Vineyards in the Okanagan are as much as a month behind normal this year, but making up ground in a hurry. No doubt, Lillooet is also a bit behind but growth will explode with improved weather. Fort Berens opened in 2009, making wine from Okanagan grapes. That is a practice that likely will continue for a few years, if only to supplement the Lillooet vineyard. Rolf De Bruin and Heleen Pannekoek, the owners of this winery, have been able to get excellent grapes, thanks to their relationship with Harry McWatters and his Vintage Consulting Group. Rolf and Heleen came to Lillooet in 2008 after leaving high-powered (and high-pressure) bank jobs in Holland. Finding land costs in the Okanagan too high, they leased (with the option to buy) a property on a bench above the Fraser River. There is a considerable history of grape growing at Lillooet but theirs is the first truly commercial vineyard. Fort Berens Pinot Gris 2010 ($18). This wine is made in the broad, rich style of Alsace with flavours of apricot, pear and white peach. There is a honeyed hint of botrytis on the nose and on the finish. The alcohol, at 13.8%, is a little on the bold side for a white wine. 86. Fort Berens Cabernet Franc 2009 ($25). This is a delicious wine with a generous finish. It begins with appealing blackberry and roasted coffee aromas, with flavours of blackberry, black currant and black cherry. The berry flavours on the finish mingle with a hint of mocha. 90. Fort Berens Meritage 2009 ($28). This is a blend of 70% Merlot, 25% Cabernet Sauvignon and 5% Cabernet Franc. It has the soft, ripe texture of Merlot, with attractive aromas of blueberry and blackberry. The berry flavours echo these aromas. The rich, ripe tannins give the wine an early accessibility and appeal. 90. One of the trendy wine styles in recent years has been Prosecco, the refreshing sparkling wine from northern Italy, popular on its own and also as a cocktail ingredient. In the Okanagan, Bernd and Stefanie Schales, the owners of 8th Generation Vineyard in Summerland, spotted the trend and decided to make something comparable. Their modest first release, a Chardonnay Frizzanté 2009, proved to be a big hit. In the 2010 vintage they plunged into frizzanté production in a big way. Last month the winery released two such wines, a white called Integrity and a red called Confidence. Beautifully presented in “bowling pin” bottles made in Italy (similar to Prosecco), these elegant products will displace more than a few bottles of Champagne. One or two other Okanagan wineries have begun to make frizzanté wines but none has adopted comparable luxury packaging. “The whole thing took us almost three years to develop,” Bernd says. Three years is a blink of an eye compared with this couple’s wine history. Bernd is the eighth generation of his family to grow grapes; ancestor Christopher Schales began growing grapes in 1783 in Germany, according to family records. That is why this couple named their Okanagan winery 8th Generation – only to discover later that one of Stefanie’s ancestors was growing grapes 10 generations ago. Bernd was born in 1972 in Germany. Following in the family tradition, he studied winemaking at Weinsberg. He was given a job in the family winery but, since it already employed numerous family members, there was limited scope for career growth. So he and Stefanie, trained in architectural drafting, began considering the New World wine industry. They were impressed with the Okanagan. After spending 10 days here in 2001, they filed immigration applications and scoured the Okanagan again in the summer of 2002, buying an Okanagan Falls vineyard in 2003. Stefanie had begun working on the drawings for a winery there – the house on the property commands a breathtaking view – when, in the summer of 2007, they were able to buy the building that formerly housed the Adora winery. Stefanie undoubtedly could have designed something better looking than this cavernous plain-jane shed. But it is a terrific location for retail sales since it is right beside a speed-limited section of Highway 97 south of Summerland. The building was also empty when they took over. Bernd spent a frantic month arranging the delivery of winemaking equipment before that vintage. He made do with his grandfather’s wine press, a near museum piece that had been shipped from Germany with their furniture a few years earlier. He has since updated some of the winery’s equipment. The frizzanté project meant a trip back to Germany for specialized equipment needed to bottle the sparkling wine. When colleagues advised against purchasing expensive computer-controlled fillers, he looked for mechanical filler. At a German winery, he found a 1961 filler made by Seitz. It was no longer in use but it is so reliable that the winery was reluctant to sell it. Now, it sits in the middle of the 8th Generation winery, hooked to a pressurized wine tank (circa 1969) that Bernd found in the yard at Ripley’s, the Summerland wine tank supplier. It is ingenious but slow. When Bernd and his staff bottled 3,500 bottles of Confidence in March, it took them more than 12 hours, not counting clean-up. But the Seitz filler worked flawlessly both for this run and for the bottling of Integrity in April. The Italian-made frizzanté bottles have the winery’s signature stylized figure 8 etched into the glass. The winery’s other wines have paper labels, all with elegant variations of the figure 8, a very effective label change made during the past two vintages. 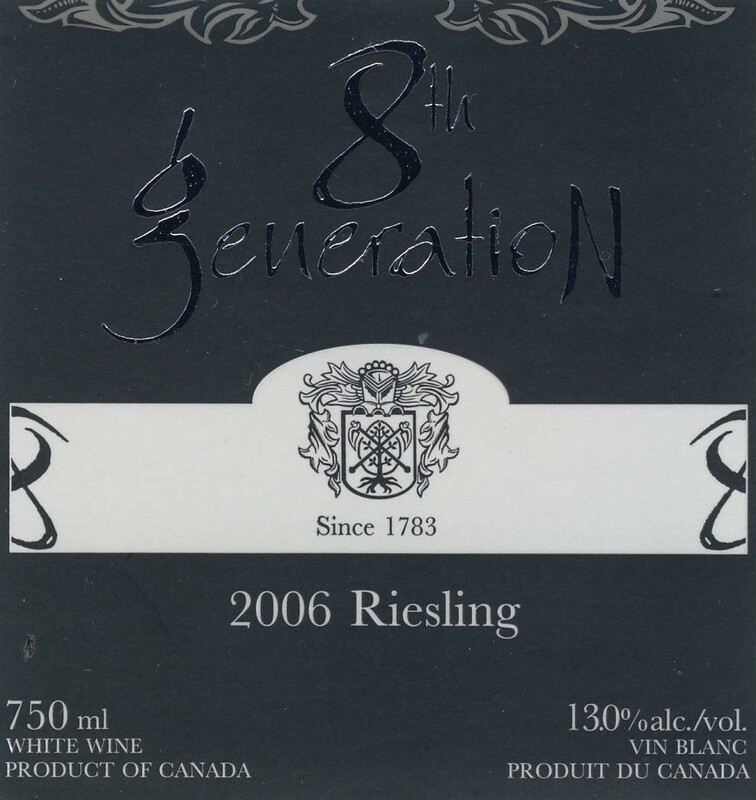 The 8th Generation wines are much more visible in wine stores and in restaurants than under the previous black label, shown below. The quality of the wines is nothing less than what one expects from eight generations of experience. Here are notes on the current releases. Confidence 2010 ($22.50 for a total production of 418 cases). The wine, made largely with Pinot Noir, presents with a lovely cranberry hue. It has strawberry aromas, flavours of strawberry and raspberry and enough bubbles to give the impression of a creamy texture before the wine concludes with a crisp and refreshing finish. Even though the wine is bottled at a third the pressure of Champagne, there is a fine display of bubbles. The moderate alcohol, 12.2%, adds to its refreshing quality. 89. Pinot Gris 2009 ($19.99). This wine was partially barrel-fermented and a third was barrel-aged for additional complexity. The fruit flavours, apple and pear, remain out front, where they should be. This is an appealing white with a rich mid-palate and a crisp finish. 88. Chardonnay 2008 ($18.99). This is a lightly oaked Chardonnay, with notes of vanilla mingling with the melon flavours and the hints of butter and nuts on the finish. 88. Sauvignon Blanc 2010 ($18.50). During a crush in New Zealand, Bernd fell in love with Sauvignon Blanc. He was able to buy some of that variety last year from a Naramata grower and is thinking of planting some in one of his own vineyards. Again, a third of the wine was fermented (but not aged) in barrel. It is a tangy and refreshing with, with flavours of lime and gooseberry that would do New Zealand proud. 88. Riesling 2010 ($19.99). In 2010, the winery did not have enough grapes to make its usual two styles of Riesling (dry and off-dry). This is the off-dry version with 16 grams of residual sugar but so well balanced that it seems almost dry. It has aromas and flavours lemon and grapefruit, with a long and refreshing finish. 90. Pinot Meunier Rosé 2010 ($19.99). This is certainly one of the best of the 2010 rosé wines from the Okanagan, beginning with a lovely hue and delivering a fruit basket of strawberry and rhubarb, apple and grapefruit. The residual sugar gives the wine flesh on the palate and the acidity ensures a refreshing finish. There is even a hint of white pepper on the finish. 91. Merlot 2009 ($21.99). A wine with good concentration, this has aromas and flavours of blueberry, lingonberry and currants, with spicy berries on the finish. 90. Syrah 2009 ($23.99). Made with estate-grown fruit and aged in French oak, this wine has aromas of pepper and red fruit, flavours of plum and leather with pepper on the finish. 88. Syrah Icewine 2010 (about $65 for a half bottle when released this fall). This is 8th Generation’s first icewine. They intended to make one in 2007 but rushed to pick the grapes for late-harvest wine after deer got into the vineyard. There is a story to this wine as well. At the very end of vintage in 2010, the Syrah was still on the vines for table wine and Bernd decided to take the weekend off before picking. When an unexpected freeze settled in after the weekend, icewine was his only option – and, he thinks, his best. While the table wine might have been average, the icewine is excellent, with a lively acidity balancing the plum jam flavours and giving the wine a clean, fresh finish. Only 180 cases of 375 ml bottles were made. 90.